Built ready for high volume areas, these ADA accessible, all-steel utility tables have a variety of indoor and outdoor applications. Popular for their sturdy construction most commonly used as a event and service tables. 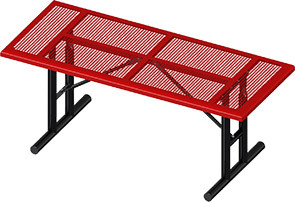 Perforated pattern and smooth rolled edges made from 12-gauge steel with 5/8" punched hole.The table top is finished with a resilient ultra-modern UV-stability polyethylene. This finish provides all-weather corrosion and impact resistance. Engineered for superior service, the 2-3/8"O.D.frame with 1-1/16"O.D. bracing is MIG welded and powder-coated.